Short version of the classic 3-saddle design has been around for over 50 years and is still regarded as the ultimate "Tone machine". Now with the staggered brass saddles, we have achieved individual string intonation never before available in a design of this type. 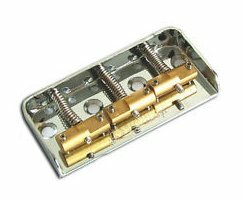 The baseplate is a faithful reproduction of the original and is steel – this is very important in a bridge of this style due to the effect it has on the magnetic field of the pickup mounted in it.